Over 20 years ago, Colombia, like most Latin American nations, renounced the development model inspired by ECLAC and enrolled in the liberalization model derived from the Washington Consensus. This change led to a reduction in state involvement in economic dynamics, enterprise privatization, unilateral trade liberalization and the spread of regional trade agreements (RTAs) with neighbors and nations around the world. To provide a framework that legitimizes the new political and economic direction the country has been endowed with documents such as the Monitoring Report, also 20 years ago, and a dozen CONPES that have claimed to be the beacon to follow to a safe harbor. But time passes and the balance is not yet satisfactory. Despite being, for decades, one of the most stable nations in the region in macroeconomics, to achieve significant export growth and prove an attractive nation for foreign investment, especially in recent years, developing data-that is not synonymous with growth- indicates that the country is not moving in any direction. But time is handing us the bill for missed tasks. In 2006, the Global Competitiveness Indicator World Economic Forum, which measures 142-nations, our country stood at the 65th place among 125 countries. In 2011, Colombia was ranked 68th and in 2012 at 69. If we compare ourselves with our Latin American neighbors, the scenario is not better: we fell from the 5th to the 8th place. – According to the Privy Council on Competitiveness, between 2006 and 2010, income per person in Colombia has been growing at an average rate of 4.4%. However, the Council believes, if we are to meet the goal of being one upper middle income country by 2032, it should reach growth rates between 6% and 7% per year on average. – At the beginning of the last decade of the twentieth century, Colombia depended heavily on exports of coffee, some oil and other agricultural or agro-industrial exports, mainly. 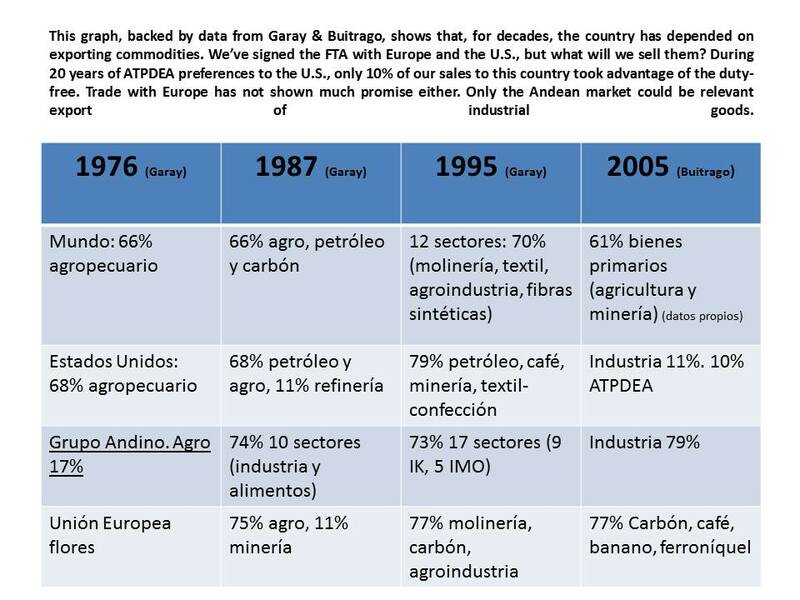 After the discovery of oil in Cusiana and global coffee crisis, Colombia became more dependent on mining. 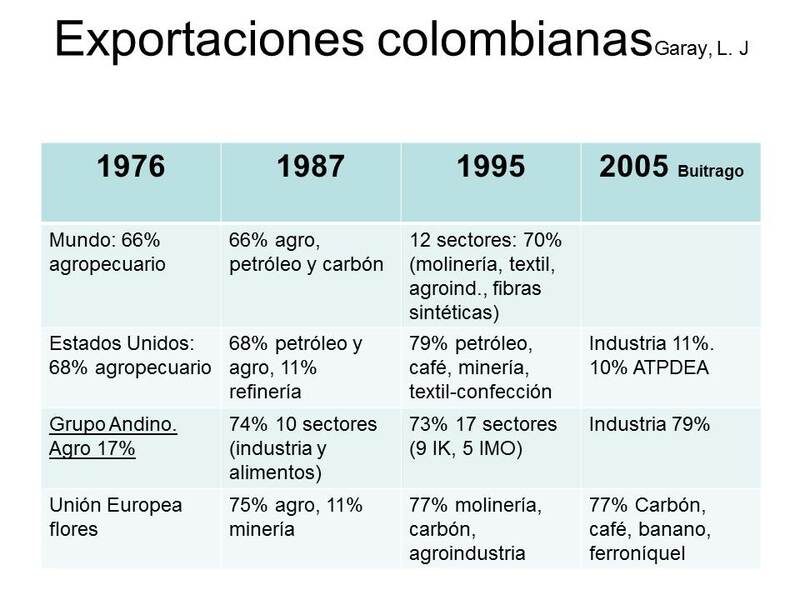 In 2006, Colombian exports with low levels of innovation amounted to 83% of the total, by 2012, this figure reached 90%. Are we back? All signs point to yes. Is it bad to grow depending almost exclusively mining? No, not bad. First we can say that a country with sufficient reserves for decades can finance the dynamics of its development projects, even leverage those to generate new industries (manufacturing, services, etc..). But Colombia has not substantially increased its oil reserves. These are on average 2,200 million barrels, a low figure compared to other Latin American countries such as Ecuador which produces 6,200 million to 11,400 million or Mexico or Venezuela that reach almost 300,000 million. So in addition to the fact that we need the resources of the “oil boom” to be used to build capacity (infrastructure, education, CT + I, etc…) We also require that explorations increase the reserves so that we have the cushion to finance the industrial conversion of our economy. - Absence of a state policy on infrastructure. For decades in this country there’s been talk about the need for a interoceanic canal, tunnels to facilitate traffic through so many mountains, a new railway, a project for navigation through the Magdalena river, another port in the Pacific, etc… However, most of these proposals are still on paper and those under construction are years behind. 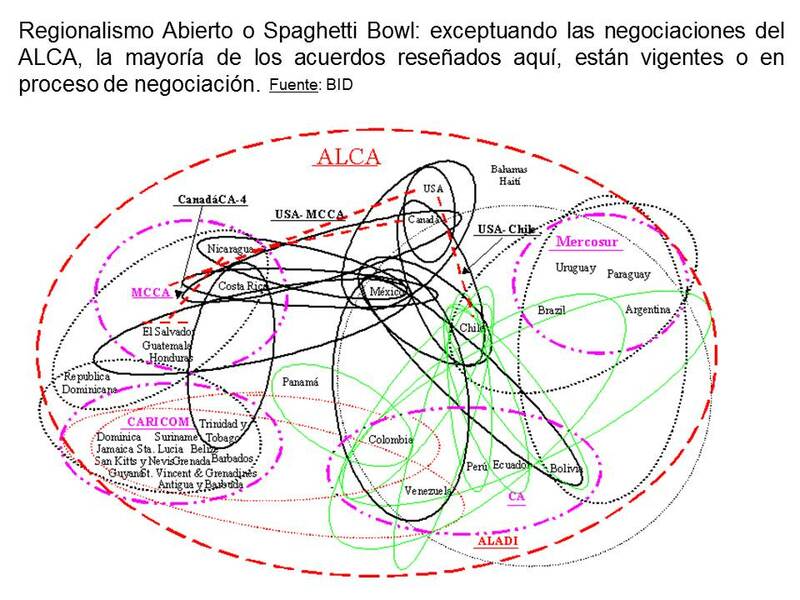 - High laboral informality. 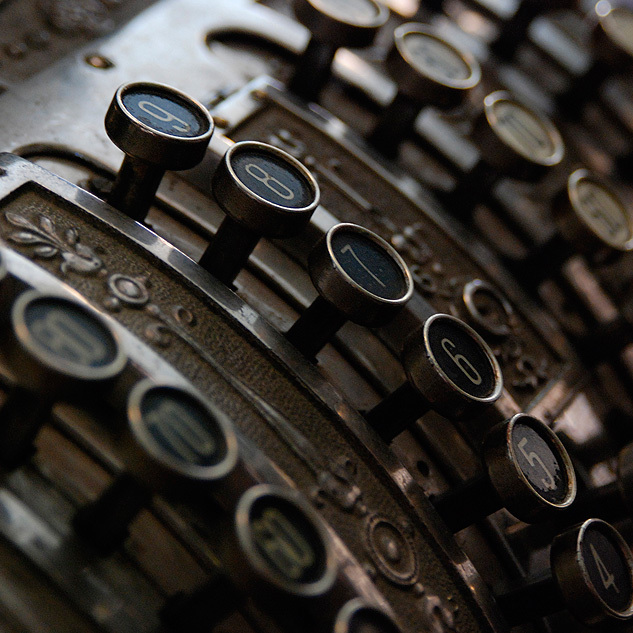 What is handled as a strategy to reduce labor costs, informality, is in actuality a drag that does not us to modernize our economy: there are workers who do not contribute to social security, worker cooperatives exist that threaten stable pay, there’s jobs that are performed through contracts to provide services rather than indefinite term labor linkages, etc. This worsens the fiscal deficit-SISBEN-, weakenes revenue base of households and thus the purchasing and debt, stagnates the domestic market. - Abandonment of the rural sector. The field is not the supplier of raw materials for the city and, therefore, is not a strong market for the purchase of industrial goods and services. Although the armed conflict is a determinant factor of this abandonment, rural informality, and extensive landlordism “fattening”, accompanied by unproductive fragmentation, do not facilitate the transition to a competitive field. 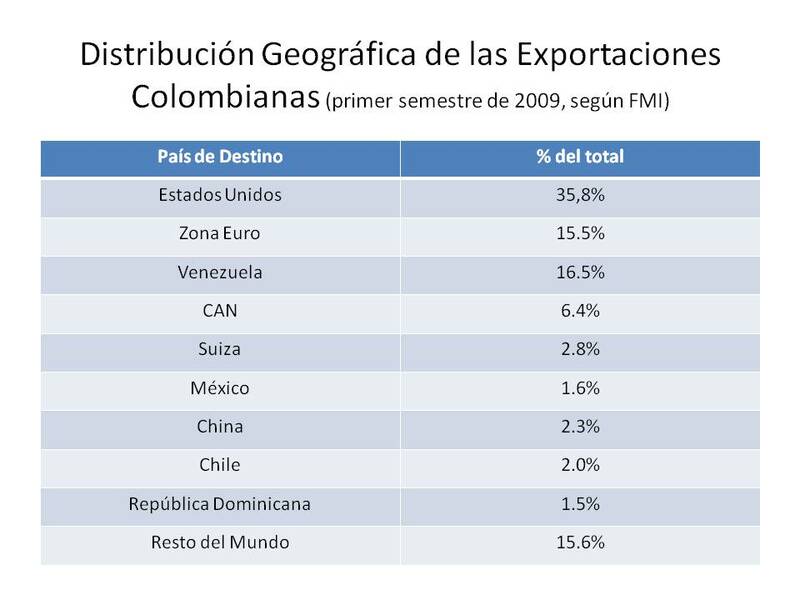 - Colombia: a country that does not invest in R & D. This is evident: our exports of high and medium technology amount to barely 9%, and we are a country without patent path. While successful emerging markets spend several points of GDP to CT + I, Colombia spends just under 0.3%. Although a new System of Science Technology and Innovation has been defined, and Colciencias has been given the status of Administrative Department, at the same time considerable resources have been approved for research and innovation, there are indications that the political prey resources will prevail over the long term aspirations of this country. All these shortcomings show that we are far from a new project Country, in other words, that Colombia 2032 is an ode to the flag … and nothing else.